325-watt stand mixer and 5-quart-capacity bowl with ergonomic handle. Tilt-back head for easy access to mixture; 10-speed control panel. Includes flat beater, dough hook, wire whisk, and bonus pouring shield. Durable all-metal construction designed for long life and quiet operation. KitchenAid's Artisan stand mixer is a substantial piece of equipment: 325 watts of mixing power make child's play of creaming butter, kneading dough, and whipping cream. The kid in you will appreciate how quick and easy it is to mix up a batch of cookie dough. This model comes with three attachments: a flat beater for making batter, meat loaf, and all textures in-between; a wire whip for egg whites, mayonnaise, and more air-infused creations; and a hook for mixing and kneading yeast doughs. All three are solidly constructed and easily secured to the beater shaft with a simple twist. This model also includes a pouring shield for guiding ingredients to their proper destination, and the bowl itself locks tight to the base. Standing about 15 inches high, jutting out a foot, and weighing more than a grown woman's bowling ball, this stand mixer isn't the sort of appliance you'll wipe down and put away. Better to find a square foot of free counter space for easy access; besides, this machine is as pretty as it is rugged--you'll want to show it off. KitchenAid Artisan Stand Mixer features a new tilt-head and generous 5-quart capacity to make it the ultimate in user-friendly design. Rugged all-metal construction ensures long life and quiet operation, and rubber feet anchor it securely while in use. S unique planetary mixing action, and a powerful 325-watt motor. The Artisan has a 5-quart stainless steel bowl, with ergonomic handle and clear plastic pouring shield, but it can also accommodate the 3- and 4 1/2-quart bowls. Comes with burnished metal flat beater, dough hook, and wire whip. Bowl and attachments are dishwasher safe, and the mixer base and head have smooth, rounded surfaces that easily wipe clean. Powerful Motor 325-watt motor delivers the power to mix large batches easily. USA World Sales have been in the on-line business for more than 10 years with an excellent track record i n providing excellent customer service. Our huge inventory of quality merchandise at very affordable prices have been the backbone of our main existence. We provide a variety of choices ranging from health & beauty requirements, household appliances/accessories and other electronic devices that we believe are essentials in living a comfortable life. We do appreciate your five star feedback. Our client's privacy is very important. We guarantee that NO information collected by us will be distributed. ATTENTION ALL CUSTOMERS: ALL ELECTRONIC ITEMS ARE 110V. 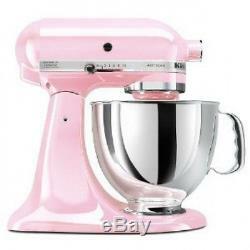 The item "KitchenAid KSM150PSPK Pink Komen Foundation Artisan Series 5-Qt Stand Mixer New" is in sale since Tuesday, February 7, 2012. This item is in the category "Home & Garden\Kitchen, Dining & Bar\Small Kitchen Appliances\Mixers (Countertop)". The seller is "usa-world-sales" and is located in Los Angeles, California.